Promotional image for the episode. "Oxygen" is the fifth episode of the tenth series of the British science fiction television series Doctor Who. It is written by Jamie Mathieson and was broadcast on 13 May 2017 on BBC One. "Oxygen" received highly positive reviews from critics, most commenting on the overlying themes of the episode and the aspect of capitalism. The Doctor (Peter Capaldi), Bill Potts (Pearl Mackie) and Nardole (Matt Lucas) investigate a space station after receiving a distress call sent by them, but find that the station is infested with a crew of walking dead. The trio need to base their plans on how much oxygen they have left, when they find themselves in a situation of no hope. The Doctor, Bill and an angry Nardole travel in the TARDIS to follow a distress call to a deep-space mining station. 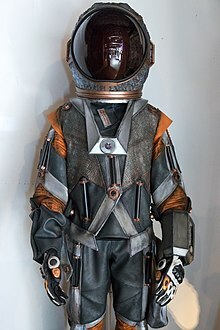 When the TARDIS is jettisoned by the station's computers, the trio are forced to wear "smartsuits", robotic spacesuits capable of independent operation tied to the station. The suits are also the only source of oxygen, as the mining company does not provide an oxygen atmosphere inside the station, and every activity is measured in breaths. The surviving crew warn them that some suits have received instructions to "deactivate" their "organic components", killing the wearer via an electrical discharge but remaining autonomous. This signal can be carried by touch, which has caused most of the crew to be turned into zombies, enslaved to the suits' programming. The Doctor and the others plan to walk outside the station to an uncompleted portion not updated in the computer systems to hide. Bill's suit malfunctions during depressurisation and forces her to remove her helmet. To save her, the Doctor gives her his helmet as they spacewalk. He survives the vacuum of space, but has gone blind from the ordeal. The computer discovers their location, but as they flee, Bill's suit again malfunctions and will not move, nor will it allow the others to carry it or release her. The Doctor leaves her behind, assuring her she will not die. She is, however, electrocuted when the zombies touch her. The Doctor reveals the limit of breaths is an algorithm to stop people "wasting" oxygen, part of the company's automated profit-making system; killing the wearers was just the logical endpoint of corporate profit over human life. He hacks the station's systems to cause the station to self-destruct if they are killed, and convinces the others this is a "good death" and revenge against the corporation. The computers recognise this threat to corporate profits and recalculate the suits' programming, and the zombies turn over their oxygen supplies to the survivors. The Doctor then revives Bill, knowing that her malfunctioning suit did not have enough power to lethally shock her. The TARDIS is recovered, and they drop the survivors off at their head office to confront the company; the Doctor notes there was a successful rebellion six months later. Nardole restores the Doctor's eyes, but when they return to the university and Bill departs, the Doctor reveals that he "can't look at anything ever again. I'm still blind". The Doctor tricks Nardole into believing that removing a fluid link will disable the TARDIS, when in fact it does not. In the 1963 story The Daleks, the First Doctor does the same thing to Ian Chesterton, forcing them to investigate a Dalek city to recover the materials needed to fix it. The episode opens with the Doctor saying "Space, the final frontier". This is the classic opening in the title sequence of the original Star Trek science fiction television series, which ran from 1966 to 1969. The Doctor quotes 1 Corinthians 15:55 when he says "Death, where is thy sting?" The read-through for "Oxygen" took place on 12 October 2016. The episode was filmed as part of the fourth production block alongside the tenth episode of the series, "The Eaters of Light". Shooting began on 17 October and ended on 18 November 2016. In his newsletter, Jamie Mathieson revealed that "Oxygen" was originally intended as a prequel to his 2014 episode "Mummy on the Orient Express". In earlier drafts, Kline, a corporate representative, appears on a monitor to offer the characters promotions and stock options if they will spare the ship. Recognising Kline's voice, the Doctor takes the crew to safety by TARDIS, destroying the ship as they leave. It is revealed that the company behind the mining station will one day have a subsidiary specialising in analysing ancient weaponry, and that Kline will be fired as a result of his fumbling the negotiation, living on only as the voice of the company computer, Gus. Assistant director for the series, Lauren Pate, plays the student who questions the Doctor in the opening scenes. The episode was watched by 3.57 million overnight. The episode received 5.27 million views overall, and it received an Appreciation Index score of 83. "Oxygen" received acclaim from critics. It currently holds a score of 100% on Rotten Tomatoes. Zoe Delahunty-Light of SFX Magazine gave the episode a rating of 4.5 stars out of 5, complimenting the idea of oxygen becoming a limited resource, and how the idea related to every plot point of the episode, rather than being an excuse for the tense situations. She also praised Pearl Mackie's portrayal of Bill in the episode, Mackie's acting being "consistently honest, raw at times, and never, ever whimsy", and her "death" scene being "guttural" and "heart-wrenching". Scott Collura of IGN gave an 8.1, admiring the continuation of standalone stories in the tenth series and the work involving the spacesuits keeping the Doctor and the other characters alive, but also noting the controversial aspect of capitalism that was investigated throughout the episode, stating that "this time around the resolution feels a little pat, even if the underlying themes of the episode might resonate strongly for certain viewers." He also stated that the most dramatic scenes of the episode, Bill's "death" and the Doctor's blindness, did not land as solidly as he'd thought that they should have. Ross Ruediger of New York Magazine wrote a positive review, giving the episode 4 stars of 5. He praised the writer for his mature script, stating that "Jamie Mathieson writes great, thought-provoking Doctor Who episodes and "Oxygen" is no exception." He then went on to compliment the production values, expressing his view that the production team delivered amazing imagery to complement the intense script of the episode. Patrick Mulkern of Radio Times gave the episode 3 out of 5 stars, praising the story for its truthfulness to the fundamental themes of the show, but mildly criticizing it for lack of novelty, articulating his "struggle with the central conceit that in the future, in space, oxygen will be a commodity that you pay for dearly, even with your life." He also noted how the episode borrowed themes from other fictional films, such as Gravity (2013) and Alien (1979), as well as themes from previous episodes of the programme. ^ a b Morgan Jeffery (13 May 2017). "Doctor Who episode 5: 8 big questions after 'Oxygen'". Digital Spy. Retrieved 14 May 2017. ^ "DOCTOR WHO Delves Into Hard Sci-Fi with "Oxygen" – Nerdist". 13 May 2017. ^ Pete Dillon-Trenchard (13 May 2017). "Doctor Who: Oxygen geeky spots and Easter eggs". Den of Geek. Retrieved 14 May 2017. ^ a b c "Oxygen, Series 10, Doctor Who – Oxygen: The Fact File – BBC One". BBC. 13 May 2017. Retrieved 14 May 2017. ^ Mathieson, Jamie (19 May 2017). "The Almost Return of GUS". From the Keyboard of Jamie Mathieson #2. London. ^ "Oxygen – Overnight Viewing Figures". Doctor Who News. 14 May 2017. Retrieved 14 May 2017. ^ Marcus (22 May 2017). "Oxygen – Official Ratings". Doctor Who News. Retrieved 22 May 2017. ^ Marcus (15 May 2017). "Oxygen – Audience Appreciation:83". Doctor Who News. Retrieved 15 May 2017. ^ a b c "Doctor Who, Series 10, Oxygen". Rotten Tomatoes. Retrieved 29 November 2018. ^ Alasdair Wilkins (13 May 2017). "Doctor Who's latest space epic bites off way more than it can chew". The A.V. Club. Retrieved 14 May 2017. ^ Serrao, Nivea. "Doctor Who recap: 'Oxygen'". Entertainment Weekly. Nivea Serrao. Retrieved 16 May 2017. ^ a b Zoe Delahunty-Light (13 May 2017). "DOCTOR WHO S10.05 REVIEW: "WE GET TO SEE THE DOCTOR AT HIS MOST VULNERABLE"". GamesRadar. Retrieved 14 May 2017. ^ Kathleen Wiedel (14 May 2017). "Doctor Who Season 10 Episode 6 Review: Oxygen". TV Fanatic. Retrieved 14 May 2017. ^ a b Collura, Scott (13 May 2017). "Doctor Who: "Oxygen" Review". IGN. Retrieved 14 May 2017. ^ a b Ruediger, Ross. "Doctor Who Recap: Zombies in Space". New York Magazine. Retrieved 14 May 2017. ^ a b Patrick Mulkern (13 May 2017). "Doctor Who Oxygen review: "the lumbering cadavers guarantee creepy visuals but the basic premise is absurd"". Radio Times. Retrieved 14 May 2017. ^ Jackson, Daniel (13 May 2017). "Doctor Who Oxygen review: A claustrophobic treat of an episode". Daily Mirror. Retrieved 14 May 2017. ^ "Doctor Who News: Reaction to Oxygen". Doctor Who News. 14 May 2017. Retrieved 16 May 2017. "The Pyramid at the End of the World"
This page was last edited on 5 December 2018, at 12:33 (UTC).